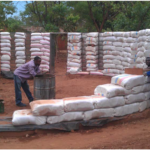 We welcome support for Never Ending Food’s activities in the promotion of Permaculture in Malawi. Before turning to outside funding sources, we always start with the resources we have, but we have found 3 areas that external funding is particularly useful: 1) building 2) Training and 3) Outreach Activities. 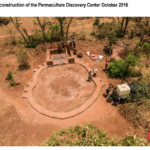 In 2016 May, Never Ending Food broke ground on an ambitious project to build a large outdoor classroom, called the ‘Permaculture Discovery Centre’. After finishing the first project we plan on continuing on the same plot, which was purchased with award money from Alice Wimpfheimer Guggenheim’s International Nutrition and Dietetics Award. Future plans include a Community Composting Toilet and a home for the Permaculture Manager at NeverEndingFood. The aim is to make the buildings themselves a demonstration of sustainable building materials and technologies. The walls will be comprised of a combination of rammed earth and ‘super-adobe’, the roof will be a blend of materials, including recycled tin cans from local restaurants, and the lighting will take advantage of natural sunlight with glass bottles integrated into the wall. There will be a lockable storage room that will accommodate Never Ending Food’s food and resource display, which will be able to be rolled out into the teaching area when groups visit. Seating for groups will be made up of auditorium-style rammed earth tiers that should be able to seat up to 50 people. We are extremely excited about this project and we sincerely hope that it will help with sharing Permaculture ideas in Malawi. Permaculture Design Certification, International standard 72-hour course. A typical PDC in Malawi usually costs about $500 US/participant (for course fees, lunch, and snacks), with an additional $700 US/participant covering supper, bed and breakfast for the two-weeks. See this PDC Pamphlet for a typical 12-day PDC that is offered in Malawi, including some of the costs. Short Courses: Nature’s Gift, the Sustainability Centre in Blantyre and several other emerging trainers are offering short courses that run from 1-6 days for topics such as: Introduction to Permaculture, Natural Medicines, Intro to Gardening, Intro to Organics, Thatching, and Cob-Building. These short courses are about $30-40 US/day/participant not including transport and accommodation. Community-based trainings (short courses or PDCs). A trainer is either hosted by the community or is supported to live in/near the community for the length of the training, as well as return for follow up support. Communities contribute what they can towards facilitation, food and training supplies and outside funding is used at about $10-20 US/day/participant for trainer transport and the costs that can’t be covered by the community. Another option we’ve used for 3 teenagers in our community is to hold a year-long PDC after school, on holidays and weekends until they finished their 72-hour PDC curriculum. They did their designs on 1.5 acres of land which is now being implemented. They are paid a stipend but need to put in work time as well. Progress can be tracked on this site and on our Facebook page. International Permaculture Conference and Convergence, IPC. We’ve been able to advocate for and secure funding for Malawians to attend these IPCs (2006 Brazil, 2009 Malawi, 2011 Jordan) which happen every other year. Contests – this is a great way to help people win a well-deserved prize for their hard work, such as a new compost toilet, food dryer, tools, hand carts, watering cans or other similar technologies. The cost of this activity involves time, communication, judging, prize ceremony, media spots and the prize itself. Contests can be run at many different scales and can be $40 – $500 (more for national level initiatives). Thatching & other sustainable building techniques – this is a lost art that needs to be revived. 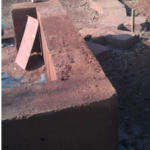 It is expensive to find a person and materials to do the initial training and building (the quotes we’ve gotten are about $40 US/square meter or about $4,000 US for a typical village hut. Once the skills are in place and the materials established locally (poles and thatching grass), the area will be able to build their own solid homes that can last a lifetime (and longer! ), with simple maintenance. No donation is too large or too small, and all donations can be put to very good use. We track the use of all funds received, how they are used and communicate back to you with pictures and/or stories when possible. Use any method below to contribute. PayPal – for the simplest method – click on ‘donate’ to contribute through your bank account or credit card. US Check – contact us if you would like to mail a US check to our checking account. Cash – visitors to Never Ending Food have donated cash in foreign or local currency. Postal Order – for other currencies other than USD or MK, supporters have mailed a postal order to our Malawi mailing address. for your interest, your continued encouragement for Never Ending Food’s promotion of Permaculture, and hopefully your financial consideration as well.